In months of testing R35's running very aggressive power combinations, SSP has thought a few steps ahead and engineered a few of the pieces that will be needed once your GT-R starts pushing big power. 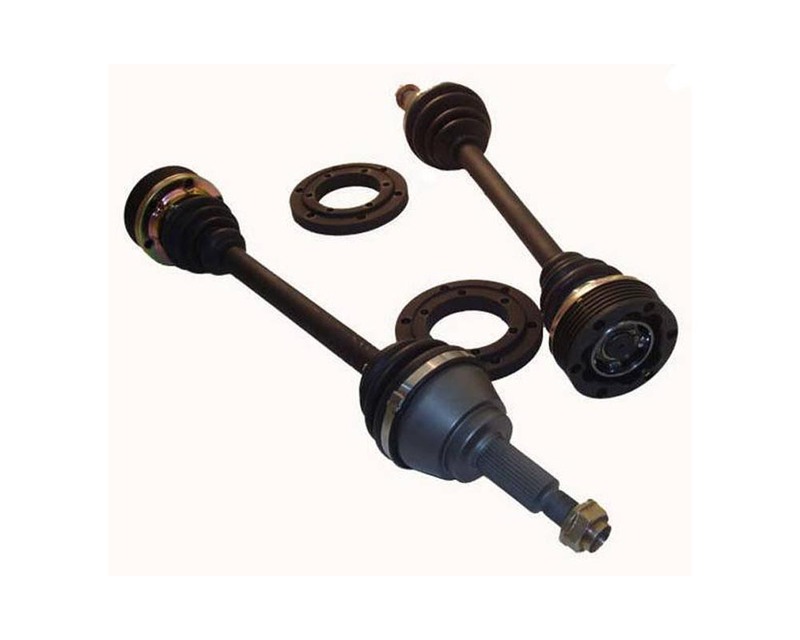 SSP has experience with high horsepower AWD cars and knows that the axle shafts are going to be a point of weakness once certain power levels are exceeded. So, instead of responding to failures after they happen, SSP has designed a solution to prevent the failure from happening in the first place. This axle kit was specifically designed for the new GT-R, starting with a new larger 6-ball outer and inner CV joints. The unique thing about this is that most newer cars are coming with outer/inner CV's with 8 balls internally instead of 6 like the traditionally designed axles that most of us have relied upon in the past. While there are many advantages to this 8 ball design, it is a real disadvantage in a high performance application. In order to fit 8 balls into the CV, material is taken away from the cage. The solid area in between the cage windows is reduced for the extra 2 balls to fit. The result of this loss of material is a weak spot in the axle itself and it is at these spots that 99% of cage failures stem from. By finding the point of weakness on the stock shafts, it became clear that going back to a 6 ball design would be the best solution to the problem. SSP's 6-ball design is not only larger in diameter, but this design keeps sufficient material where it is needed to withstand high HP. But, the improvements do not end there, as this system also includes chromoly "uninterrupted torque-line center bars". This innovation from DSS allows the axle center bar to become tensional (allowed to twist) without any unnecessary snap ring grooves, boot location grooves, or other deviations in the axle bar that would cause concentrated stress points and eventual failure to the bar. The inner CV has been replaced with the famous Porsche 930 design cross-groove CV and SSP has also included a conversion plate and hardware to mount the CV to the OE differential flanges. The result of combining all of these new design elements is one serious axle set for the street, drag, or rally applications. And the innovation does not end there as SSP will also be bringing upgraded front axles and an upgraded front drive shaft solution to market for this incredible car. South Side Performance Inc. specializes in the development and manufacturing of high performance Dual Clutch Transmission products for Mitsubishi, Nissan, Volkswagen, Audi, and BMW. This includes clutches and transmission components for most modern Dual Clutch (DCT) transmissions, fuel systems, weight reduction components, breather systems and many other parts that address the needs of demanding, high performance vehicle applications.